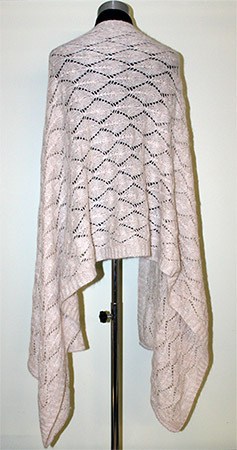 Minimum quantity for "LEAF Shawl" is 1. Our LEAF Shawl is made using one of our new SURI Alpaca blend yarns, showcasing Suri fiber's natural luster and beautiful drape. The leaf pattern knit and the new suri yarn together have produced an amazingly intricate design all while being soft and luxurious to the touch. 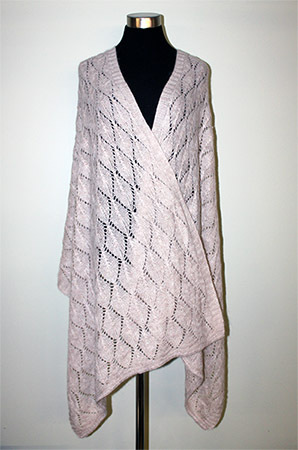 This shawl is absolutely beautiful in person, we encourage you to browse the product photos to see how it can be worn and get a feel for it's generous size. 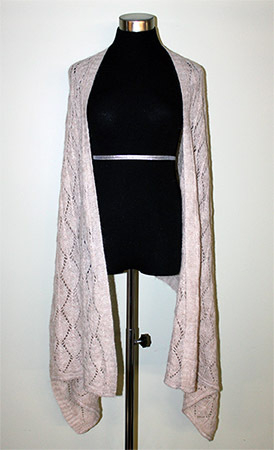 The LEAF Shawl measures approximately 22" wide by 72" long. Produced in Lt. Fawn. Save $7 per shawl by buying 6 or more!